Women’s Day to celebrate institutional collapse? Yesterday, on 8 March 2017, International Women’s Day was observed with much fanfare across India. Everything was in place, almost orchestrated to perfection with nothing amiss. The President and the Prime Minister issued customary greetings and honoured women who had made their presence felt and achieved something. There was something peculiar in the mix though. The women Indian premier Mr. Narendra Modi honoured as ‘clean warriors’ for their contributions in improving rural sanitation included a certain Sushila Khurkute. Mrs. Khurkute, 30, was recognised for digging the rocky grounds of her village continuously for three days to build a toilet. She was seven months into her third pregnancy at the time of her toilet building, a time when she should not have been engaging in such heavy work, so she could keep herself and her child safe. In fact, she was doing the work all by herself, i.e. more than 2 years after the launch of PM’s pet project, the Mission Swachh Bharat on 2 October 2014, which has had a budget earmarked for constructing toilets for people like Mrs. Khurkute. She had not received any help from local administration, which she should have received. The district authorities were in fact unaware of her efforts until UNICEF volunteers chanced upon her and alerted them. This, in essence, sums up the monotony of everyday lives ordinary Indian women face usually living away from the reach of International Women’s Day greetings. They have to fend for themselves, expecting nothing from the plethora of welfare schemes launched in their name with much fanfare. They have to live by dint of their own effort, with no access to public institutions of welfare or justice. They have to achieve everything despite these instituions. And if they do come into the radar of State institutions, they should be ready to get ‘honoured’ provided no uncomfortable questions get asked. Sample this one: Why was Mrs. Sushila Khurkute exposing herself and the unborn child to danger by digging up rocky terrain during the seventh month of her pregnancy? Where was the government’s Accredited Social Health Activist (ASHA), duty-bound to counsel women about birth preparedness and importance of safe delivery. The questions only start here. 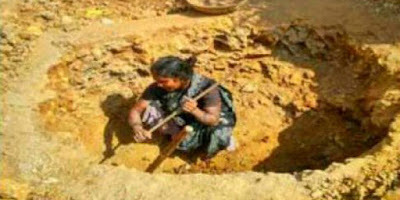 Everyone knows she was in seventh month of pregnancy while digging rocks for constructing a toilet, relentlessly for 3 days. Who was taking care of her children at the time? As reports indicate, her husband, a poor daily wager, was working elsewhere in the district under the state’s employment guarantee scheme and had hardly time to be home. Who was taking care of her children? Do they go to the local Anganwadi centre? Does the village have one in the first place? How were their nutritional requirements being met while she toiled on a toilet? This brings us to a bigger question. Why did the whole system fail to even acknowledge such a colossal failure to ensure the rights of Mrs. Sushila Khurkute? Fixing accountability for this failure may be a bridge too far in the present circumstances. But, acknowledgment? Is celebrating her effort enough to push the violations of her rights under the carpet? Unfortunately, we, civil society members, end up often being complicit in such crimes, by not asking these questions ourselves. Celebrating Women’s Day is not only about celebrating the women who have made achievements despite public institutions, often even when faced with active opposition of these institutions. They are daring role models and must be celebrated. There are countless women unable to chart their own path in the face of powerful dysfunctional institutions that may work against them. These women can only succees with the active support of functioning public institutions. And, these majority women are entitled to this much, support of the public institutions that are meant to support them. We would be failing them if we do not make these institutions deliver. We would also be providing the State a rationale to keep abandoning citizens by “honouring” the odd ones who thrive no matter what, pushing millions into continuing to live in misery, unsupported and handicapped by dysfunctional institutions.